In case you missed this earlier post, Questionmark has an OData feed that allows users to get direct access to data in their Results Warehouse—the same data source that is used to drive the reports in Questionmark Analytics. If you have not done so, I encourage you to check out our OData API for Analytics video to learn how to connect to the OData feed, import data and create a simple report. 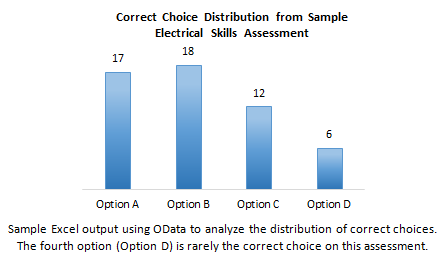 Of course, the only reason we create assessments and collect data is so that we can make informed decisions, and the data in the OData feed just come across in their raw state. To help you make sense of the data, we are developing short video tutorials that walk through introductory OData examples using the free PowerPivot add on for Excel. We will announce these new videos in the blog in the coming weeks, and you will be able to find them in the Questionmark Learning Café. If you have a research question that you think could be addressed with OData, please let us know! Your suggestion may lead to additional tutorials that will help other people expand their own research. I am in the process of trying to connect to the O Data feed with Excel 2013 Power Pivot. However, I am not sure of what Data Feed url to use. Could you advise? It will depend on whether or not there is a specific feed (AKA “resource path”) you are trying to access, but at the very least, you will need to put in the URL root. There is an article in the Questionmark Knowledge Base about the anatomy of the OData URL that shows you how the URL is constructed with a root, resource path (feeds), and query. For specific information about each available OData feed from Questionmark Analytics, I would suggest checking out the OData User Guide pages. If you want to get your feet wet with some examples, you could try the feeds that we use in the OData tutorials shown in the Learning Café, many of which are demonstrated using Excel 2013 and the PowerPivot add-in. Remember that the OData feeds are run from Analytics, so you will need a login that has permission to access Analytics in Questionmark OnDemand (OData will be available in Perception in version 5.7). If you need additional help, please do not hesitate to contact our Technical Support team at support@questionmark.com. Thanks so much for the follow up and for the additional information. I am working with the tech support team on this.